With so many old houses in our neighborhood, so many of us have situations where water has rotted out wood around window ledges, gutters, downspouts, roofs, decks, and more. This rotten wood is not only unsightly but it can be an attraction for carpenter ants, woodpeckers, rodents, and other critters. Instead of replacing the damaged wood, repair the wood and rebuild it with the do-it yourself solution from PC-Products. 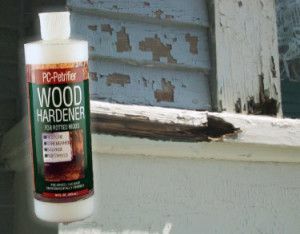 PC-Petrifier wood hardener is a water-based liquid that penetrates damaged wood, restoring it to near structural integrity. How it works? PC-Petrifier soaks into the rotted wood fibers and gives them structure once again. It can be either poured or sprayed onto the rotted wood and cures in as little as 12 hours. It is quite simple and rather amazing how it works! If the damaged wood needs to be rebuilt after it hardens, PC makes a wood epoxy called PC-Woody that will fill in those holes or corners and provide a surface that can be either painted or stained to match the existing wood. We recommend these products all the time in our store for rotted wood around downspouts or gutters that may be damaged due to water build-up. They are also great products to repair damaged wood caused by woodpeckers, who are a big problem this time of the year because fall means that it is mating season. PC-Petrifier is also a great solution for repairing soft rotted wood around the house that will likely attract carpenter ants or other bugs the longer is sits. Save money and repair damaged, rotten wood yourself with the high quality products from PC-Products. Here are links to both products on the PC website: PC-Petrifier (wood hardener) and PC-Woody (Wood Epoxy).